Check out the 2017 My First 5K Medals in display frames. The 2017 ribbons have a Velcro clasp which allows for many more medal display options. 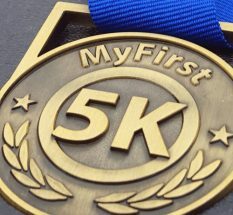 We are ready for any summer 5K race that you talked your friend or child into running with you. Don’t you think they deserve a special medal?